Since May of 2013, Port Townsend Paper Corp has been working with local entrepreneur Francesco Tortorici, the Port of Port Townsend, and Oregon researchers to explore the uses of biochar, a product of the biomass combustion process, as a stormwater filtration medium. The results of this exploration are now coming to fruition as the Port of Port Townsend installs its first biochar-containing portable downspout filters to purify runoff from the metal roofing of Port buildings. 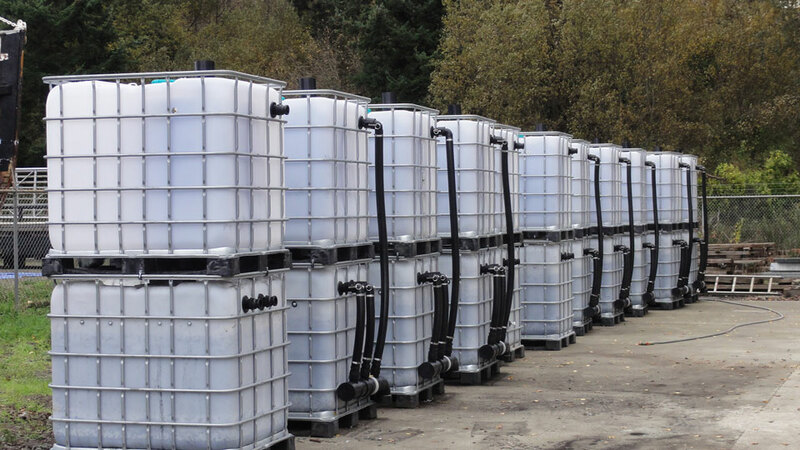 The Port of Port Townsend was on high alert to find new technology for their Boat Haven stormwater discharge in order to bring zinc levels back into accordance with the state’s requirements. When stormwater comes into contact with metals like zinc and copper, it can transport them to the nearest body of water, harming fish and aquatic life even at very low levels. The Port’s search included an investigation into the filtration technology of John Miedema, University of Oregon researcher and founder of BioLogical Carbon, LLC, and Myles Gray, researcher from Oregon State University. The Port was given a small grant by the Pacific Northwest Pollution Resource Center for testing of media blends, including biochar, and the results were astounding—one filtration unit (called a “tote”) containing biochar could remove over 99% of zinc and 95% of copper from the roof runoff. Biochar is a porous medium, meaning it is able to absorb toxins that cannot be caught through traditional sand filtration methods. It has similar properties to activated carbon, which is already being used in contaminant remediation, but biochar can also be made at a much lower price point. At the mill, biochar is created when biomass waste fuel, such as bark and tree limbs, is burned in one of the boilers to make steam used in the pulp and papermaking process. Ordinarily, PTPC would feed the biochar created in the papermaking process back into the boiler and burn it again as fuel. However, the mill has instead processed and donated the material to the initial research as well as the Port’s project. Since the trial run in April, the Port, along with John Miedema, Myles Gray and Francesco Tortorici, applied for and received a grant from the Washington Department of Commerce to fund the next phase of the project—assembly of 20 additional full-scale totes, which are now completed and being installed on various Port buildings. Tortorici sees this project as having future applications for both the Puget Sound area and statewide for any Industrial or General Boatyard Permit holder. Port Townsend Paper Corporation produces Kraft pulp, paper, containerboard, and specialty products by blending virgin and recycled fibers at their mill headquarters in Port Townsend, Washington. © 2019 Port Townsend Paper Company All Rights Reserved.